Each May, the Administration for Community Living leads the nation’s celebration of Older Americans Month. Each May, the Administration for Community Living leads the nation’s celebration of Older Americans Month. This year’s “Age Out Loud” theme gives aging a new voice — one that reflects what today’s older adults have to say about aging. As I sit at my desk, I see several flyers, postcards and publications with headlines that include the word “amplify.” When I titled my dissertation “Amplified Voices,” little did I know how on-point this phrase would soon be. I began my PhD program while working full-time as an art therapist in an Elder Care Alliance community. I knew I wanted to do research about art therapy and older adults; the first year of the doctoral program allowed me to explore the needs in the art therapy and elder care fields and to define my research interests based on gaps in the knowledge. At the start of the research ideation process, before knowing what we would investigate, I felt committed to how we would investigate. The ‘we’ in the previous sentence is purposeful; I felt ethically and academically invested in engaging in research with the elders, as opposed to researching on or about them. In our research, we investigated experiences of communication in the elder care setting. The research process involved individual input from elders, family, staff and volunteers in all our communities and group interactions with elders in one community to examine the art-based data and synthesize the findings into a mural. Using the Sprout computer system and a poseable human figure, participants created images about communication. One of the most exciting findings to me as a researcher, was the enthusiasm, interest and empowerment the elders exhibited throughout the process. 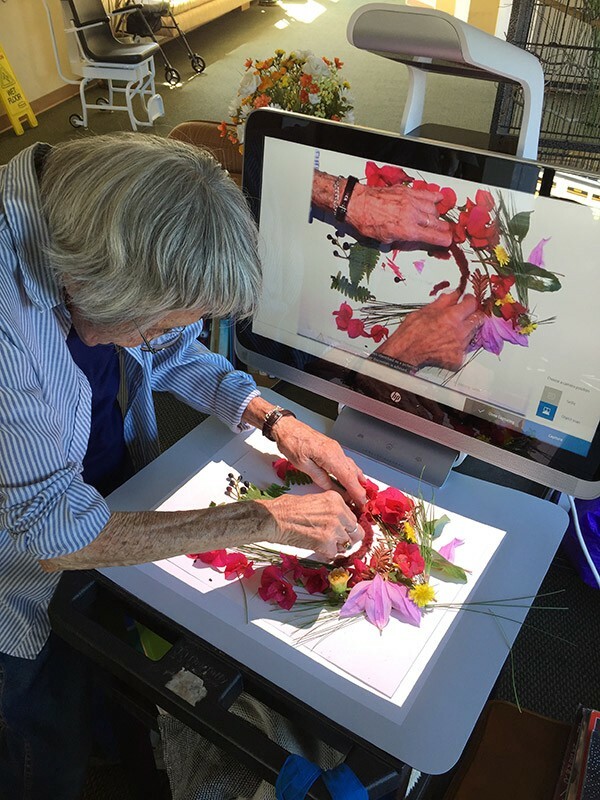 Additionally, the elders in memory care settings or with considerable communication limitations were just as able to contribute meaningful data through the participatory, art-based process. Some of the most profound and impactful statements came from elders with dementia diagnoses. Though the formal research process concluded, the inquiry continues. We have ongoing discussions and art sessions about communication and the emergent themes in the study. The mural functions as a teaching tool and as a marker of empowerment — one elder points at it to emphasize his words when he is involved in any discussion about activism, older adult voices in society or ability to contribute to public dialog. After presenting to the Sprout team at Hewlett Packard, they came out to one of our communities to talk directly with the elders and get their feedback on the computer system. We did a few publications with HP after the research concluded, which you can read here. I have the great privilege to present about the research at several professional conferences, meetings and educational settings with more coming up in the next few months. Coming up, I will be presenting about the use of new technology as empowerment in elder care settings at the Technology and Society Conference in Toronto, Canada in May, and discussing the importance of involving older adults as co-researchers at the Society for Community Research and Action conference in Ottawa, Canada in June. I look forward to sharing our process and findings with a wide range of audiences. Elder Care Alliance has opened up many opportunities for older adults to Age Out Loud over the years. Elders participate in the community through volunteerism and activism; they serve other seniors through the Mercy Brown Bag program, they attend community gatherings and vigils addressing topics they are concerned about and they take direct action when and where they are able. They share their experiences through art, writing and speaking. I am honored to work alongside so many brave, amazing, surviving, thriving, vocal, empathic and activist elders.